Thank you for supporting SpriteSpot.com! SpriteSpot.com downloadable business cards now available! Help spread the word about SpriteSpot as you attend car shows and other events! Just download the template, print some cards, and help us by handing them out to all the "Little British Cars" you run across in your travels. SpriteSpot.com serves as a complete online information source (including an extensive online forum system) for the Austin-Healey Sprite & MG Midget enthusiast. Simply put, whether you have a '58 Bugeye or a 1974 MG Midget, when you think of Spridgets, this is "The Spot"! LUCKY JOHN is here! The new book from John Sprinzel! Great news from John is that his autobiography "Lucky John" is now ready, and John is accepting orders. The bad news is that it's now SOLD OUT (sorry). 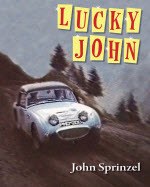 More information on John, his "Sprinzel Sprites" and his book can be found on our "John Sprinzel" page on SpriteSpot. We're both happy and sad to announce that autographed copies of "Spritely Years" are now sold out and no longer available. John's extended his thanks to everyone who's purchased a copy, and he appreciates the ongoing support of Spridget enthusiasts throughout the world. Pick a username that "makes sense"...either a name (JohnSmith) or a handle (SpriteJohn59) that would "fit" the spirit of our community. Another suggestion would be to have your SpriteSpot username be the same as your email name (i.e. "PaulSmith@gmail.com" for your email, and "PaulSmith" for your SpriteSpot ID). Quite a few of our members have registered this way, and it makes it easy to identify "real" members this way. Make sure you register with a "real" email address (i.e. yahoo, gmail, hotmail, comcast, etc.) Please avoid 3rd party services (like mailinator, or the like). If you have your own website and URL (i.e. dan@spritespot.com) then PLEASE be sure that the website is up and running--if it's not, it's a "red flag" that it's a spam site. Finally (and MOST IMPORTANTLY) please post on the forums--even if it's just a "Hi--I'm John, and I've got a 1960 Bugeye" or "I'm Paul and I'm interested in maybe buying a Midget" or "Hi, I'm George and I'm just curious as to what this site is about" or even "I'm Ringo and I play the drums." -- Pretty much ANYTHING so that I can see that you're posting and it's a "real person". Thanks--I'm hoping that a few simple guidelines like this will help minimize the amount of spam and spam users on the site. While it's likely it'll be an ongoing problem, I'm hopeful we'll be able to keep them to a minimum using these techniques. As always, thanks for your patience, and for your continued support of SpriteSpot.com! And please remember to tell your friends about us!